There is an intangible element to travel and adventure, a force that compels one forward, stretching the boundaries between the known and the unknown, The feeling one gets when boarding a plane to sites unseen, the excitement of finding an undiscovered destination, the joy of standing in a small Andean town surrounded by vast stretches of lush green mountains all stem from this vague but welcome element. 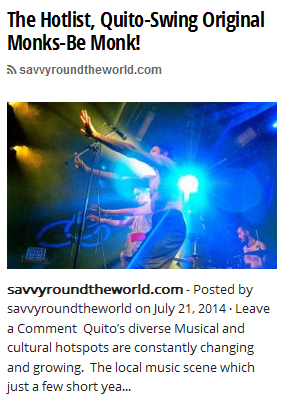 There is a lot on the travel forums about Quito.. Not much of it is good. I tend to take a slight offense at this as I have lived here for a few years and love the diversity and different areas of the city. Old Town, Guapalo, and many other areas of the city are definitely a reflection of Quito as a whole. This is something I didn´t really get when I first arrived as I needed to travel around the country to see the different people and places to understand the city and the people who move here for work and to live. Ask any taxi driver where their from or your waiter or waitress at a restaurant and you will be amazed at the places that people have moved from.. The coast, the orient, the mountains, everyone has a story to tell about why they came to Quito.